From Prince’s Feathers to Goosewort may seem a large step to take but if you’re Silverweed you can take it in your stride. How would you, for instance, feel about being called More Grass. No, I haven’t misspelled “More” and I haven’t misspelt “More” either. Spelt, of course, is that ancient grain that has a moderate amount of gluten in so it is possible to use it to make bread, or beer in Bavaria, or vodka in Poland. But I digress. Silverweed grows along our verges in profusion and it is starting to flower. 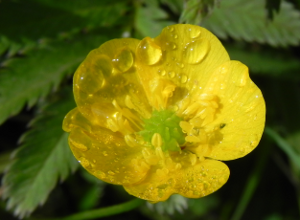 Just in case you like to be sure of these things – no, this is definitely not a buttercup, I especially selected this one as there are no buttercups nearby. You can see how easy it would be to think it was though and where they grow in close proximity, without following every flower stem back to its base, The Dog and I certainly can’t be sure. The other problem I have is that once I start investigating a plant too closely The Dog feels that digging the thing up will resolve the issue so, in the interest of the environment, I can’t give any one plant too much attention. Early on in the year the leaves were, as its name suggests, a striking silvery colour. As the seasons have progressed, the leaves have lost their silver sheen and have become a similar, boring green to all the other plants nearby. I guess the Silverweed has bowed to peer pressure.